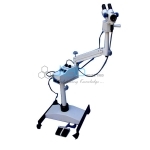 Jlab is renowned Gynae Colposcope Manufacturer, Gynae Colposcope Suppliers, Gynae Colposcope Exporter, Hospital Surgical Equipments, Gynae Colposcope India. Gynecology Colposcope offered feature high-precision optics that produces these deliver reliable performance for surgical applications. Being handily movable from one place to a different, these square measure economically priced and find usage in Gynecological applications together with conducting surgeries, identification and post operative care of and female internal reproductive organ areas of body. Further, these conjointly offer quality in police investigation female internal reproductive organ cancer and can conduct correct diagnostic assay of womb or. Further, these come with quality high performance Halogen Lamps that deliver desired cold light-weight through fiber optic cables. Also conveniently moveable for one place to another, even by lightly-built/lady gynaecologists Gynecological (Including and uterine) diagnosis Detection of uterine cancer,or uterine erosion, tumors, congestion of inflammation.